My youngest child has asked that I take him metal detecting. The problem is, when one wants to go so does the other. To solve this problem, I have ordered an additional Tesoro Compadre. One Metal Detector to rule them all! 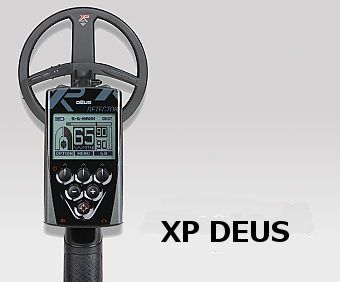 In a fit of madness, I have decided to trade my three current detectors for an XP Deus. Lately, I have come to appreciate the joy that is swinging a light weight detector. Plus I still want the power of a flagship machine. The XP Deus fits the bill to a T.
Another thing that I look forward to besides the power of the XP and its under two pound weight, is the fact that I can collapse the unit and put it in a bag and carry it with me into the house or into the office. No more leaving my expensive detectors in the car so that some loser can steal them. I LOVE my V3i! Especially now that I am beginning to understand it. I am going to miss the three frequencies and the analysis tools. I am going to miss the 22 KHz frequency for micro gold. Alas! I think the XP Deus will deliver equivalent power with the added conveniences of no wires and lighter weight. I will miss my beloved AT Pro. The Pro is the detector I became a proficient hunter with. I found more stuff with it than with any other machine. We were like one me and the Pro. At three pounds, it was my lighter detector but again, the XP is less than two pounds! I may yet regret giving up the AT Pro but the XP may work better in some of the iron infested sites around town. Last I say good bye to my newest machine; the CZ-3D. I got this machine to get the hard-to-detect coins that I know are there. I have found many coins now that didn’t read like coins at all. The CZ-3D was designed for just this kind of scenario. I didn’t count on the weight of the unit however, especially once I put the 10.5 inch coil on it. Man! I even tried hip-mounting the unit which helped but then I had to adjust my digging style. Nonetheless, this machine quickly earned a spot in my heart by finding nickels missed by everyone else. 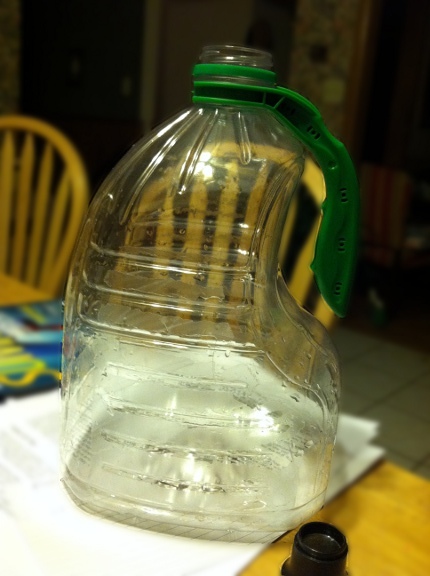 1) It works great in iron infested sites. 4) You can swing it all day! All of these things are important to me but the weight issue was what drove my decision. I hunt during the hottest months of the year and I hunt for gold so I dig more targets than other people. It was very important that the machine I use be light and easy to carry. The ProPointer is NOT dead! Reports of the Garrett Propointer’s death have been greatly exaggerated! It turned out that the thing just needed a new battery. Special thanks to my hunting buddy Patton from the Friendly Metal Detecting Forum for lending me his spare propointer which led me to discover that my propointer was not ready for the trash can. 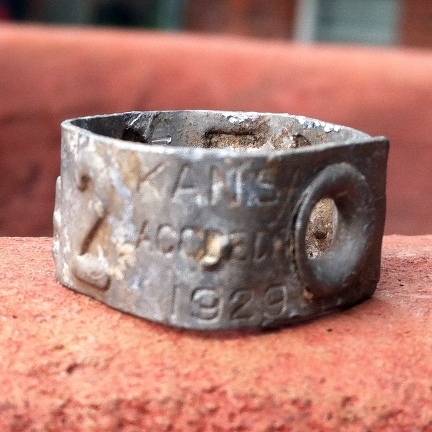 While hunting a 1925 park with the CZ-3D, I found this metal band. At first I thought it may be a bird’s id tag but once I made it round again, it seemed a bit too big for a bird’s leg. It gave a high tone on the CZ and the needle landed on the Zinc facet. If I remember right, it was about five inches deep. 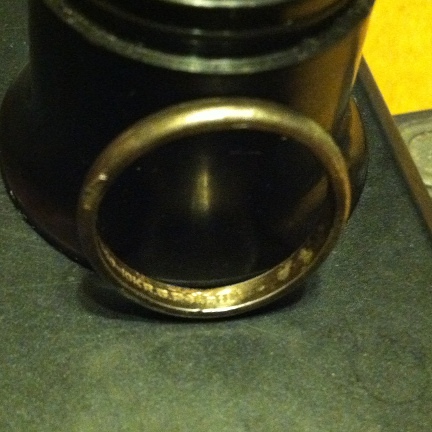 It has the following written on it: 63642 Kansas Accredited 1929. Of course, anything with a date I think it’s pretty cool. I went out this evening to hunt my honey hole with the CZ-3D. I decided to put the eight inch coil back on the CZ and hit the site with a more relaxed attitude. Well, my strategy paid off with a repeat of this morning’s hunt (plus a few nickels). First I hit a dateless Buffalo nickel. 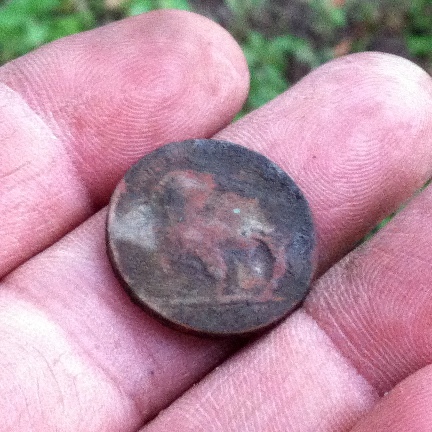 The CZ correctly identified the coin as a nickel with a nice repeatable signal. The coin was barely three inches deep. Next I hit three Jefferson nickels –1941,1949 and 1979, all correctly identified with a high tone using the Enhanced mode. Finally, the CZ gave me a nice, repeatable signal on the High Coin slot. 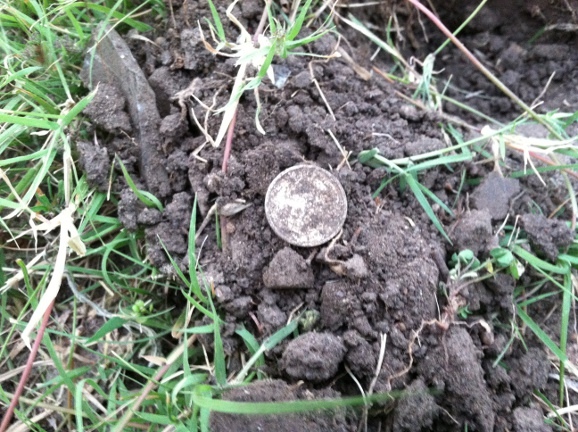 When I dug the four inch hole, a beautiful 1944 Mercury silver dime stared at me from the ground. This is my first silver coin found using the CZ-3D. I have been hunting for almost a year now and although I’ve found many interesting things, a military button was not one of them. Until now. The park where I found this button during my lunch-time hunt, McAdams park, has yielded other military– items in the past. There is a tinge of doubt in my mind as to the nature of the button only because I see no maker’s mark on the back of the button. I will research this button to make sure. At first sight, it appears to be a Marine’s coat button from WWII. The button is from an Army coat from WWII. The official diameter is 28mm or 1 inch and 1/8th of an inch. No maker’s mark visible. Civilian copy? I have been very busy these past few days but still I have managed to detect for a few minutes here and there. I have found nothing worth of a post. 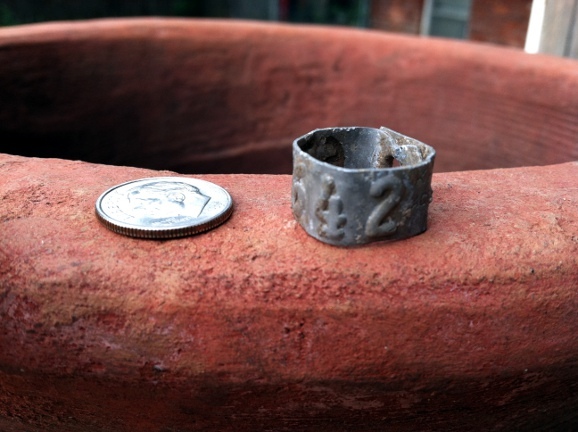 Besides coming down with a cold (at least I hope it’s just a cold), the only other meaningful metal detecting news is that I’ve put the CZ-3D away for a while. I like the CZ-3D a lot. I never dug up so many nickels in my life! But I am afraid the legendary depth claims don’t hold in my soil. I contend that the effective depth of the CZ-3D, with the 10.5 coil, IN Wichita, on a US Dime, is about eight inches. 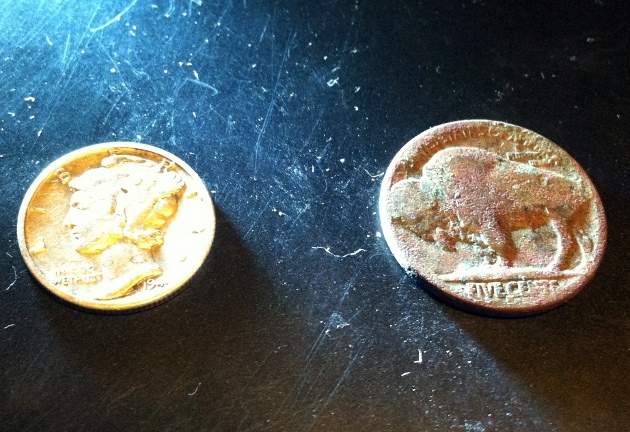 I use the dime as a gauge because more silver dimes were dropped than any other silver coin. And although eight inches is a respectable depth on a U.S. dime, I can achieve the same with the AT Pro and get the iron discrimination feature. Plus, the AT Pro is way lighter. Incidentally, I can detect a U.S. dime at ten inches with the V3i, using the ten inch coil. Still, the CZ-3D has a unique talent that no other machine out there has and that is, it can detect those weird coins that register as trash in other detectors so I am keeping it in my arsenal. My personal philosophy is that Depth is one of the major pillars of the hobby and one of the Holy Grails of metal detecting along with iron unmasking. 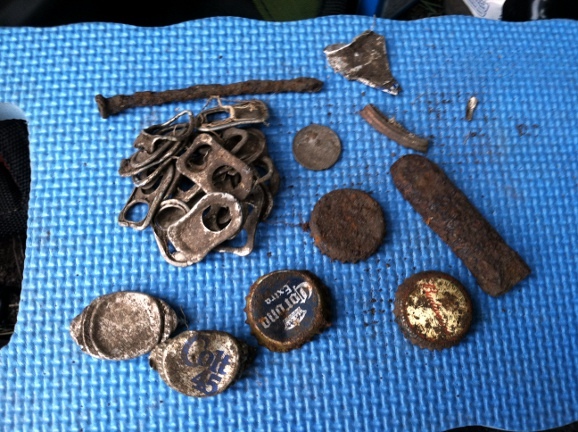 There is lots of stuff at around 15 inches of depth, including gold coins and old gold jewelry.